One of my earliest cooking memories revolves around a very old set of cookbooks. I want to say they were Time Life’s World Cookbooks or something like that. These cookbooks seemed so much fancier than our trusty red and white checkered Better Homes and Gardens’ New Cookbook. So, of course I poured over them more. The red checked book seemed so, well, American. The cookbooks were divided by country and there was an entire cookbook dedicated to French Cooking. As a child who’s most exotic meals were tacos or spaghetti, these cookbooks seemed other worldly. So, one night I asked my mom if we could make something out of the French cookbook… and I kept asking for a while until she finally relented. 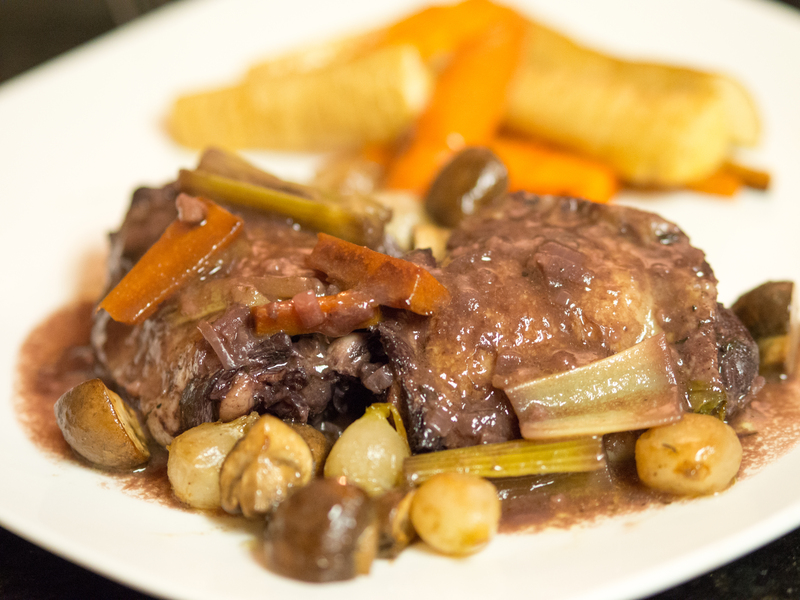 The most exotic recipe to me (I was probably all of 8 or 9 years old) was Coq Au Vin. Chicken in Red Wine. To go with it, Chocolate Mousse. I’d never had chocolate mousse, but had heard of it. I had chocolate pudding, but was pretty sure mousse was somehow better. My parents were beer drinkers, so we got cooking wine for the red wine… I know, stop laughing. But this was the 70s and, well, we didn’t know. Why would they sell it if it wasn’t good? So, that was my first foray into French cooking: making a recipe from Time Life with supermarket cooking wine. We weren’t exactly well to do, and, at the time it was a fairly expensive meal. So, my parents were very kind to indulge me. For the record, the chocolate mousse was amazing. To this day I remember that meal. I was so proud to make it. I felt truly grown up. In the many years since then, cooking Coq Au Vin, made famous in the States by Julia Child, seems odd and quant. Like a 70s fondue party. I’m almost sheepish about telling people I eat this dish, much less make it. This is another recipe like my 40 Cloves of Garlic Chicken that really should be in the rotation. It deserves a spot in your repertoire! While it is an old dish, and old dishes are not fussy. There’s no crazy ingredient you’ll only use one and rue the rest of the time it’s in your pantry (looking at you walnut oil!). The ingredients are fairly cheap and easy to come by, depending, of course, on the type of wine you use. Coq Au Vin is normally made with a tough, old bird. It’s rare to come across those nowadays, although my farmer’s market does have a great guy that sells “stewing hens”. So, I use chicken thighs. Today’s chicken breasts get woefully overcooked in this dish and can’t really stand up to the red wine. 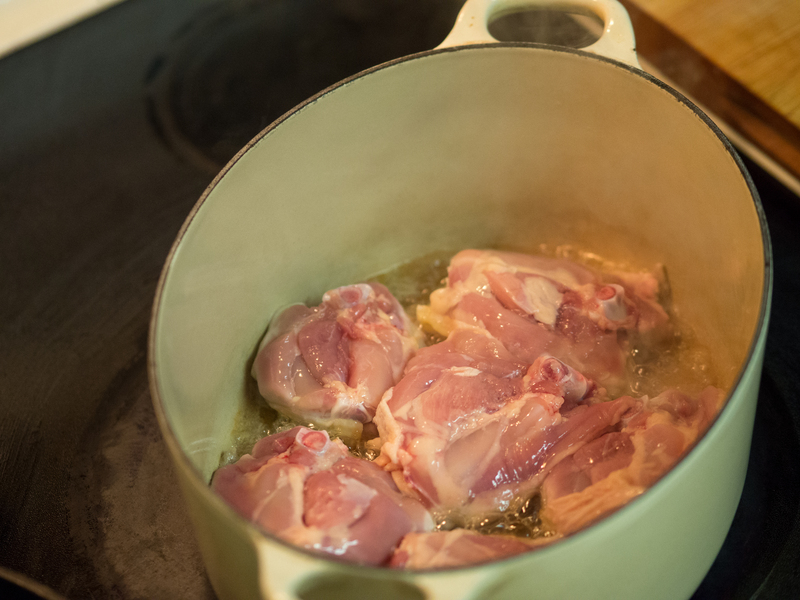 You also don’t have to simmer the chicken as long, because the chicken isn’t really “old” anymore and becomes tender rather quickly. I will admit to a cheat. Julia Childs starts this recipe off by rendering the fat off of carefully sliced lardons. As someone who is always looking to maximize my food use, I fastidiously save the bacon fat every time I cook bacon. So, I can skip the rendering step and shave about 20 minutes off the cook time. If you don’t have bacon drippings, please render away! Heat bacon fat in an enameled dutch oven over medium high heat. Sprinkle chicken thighs with salt and pepper and place in the pan skin side down when fat sizzles on contact with chicken. 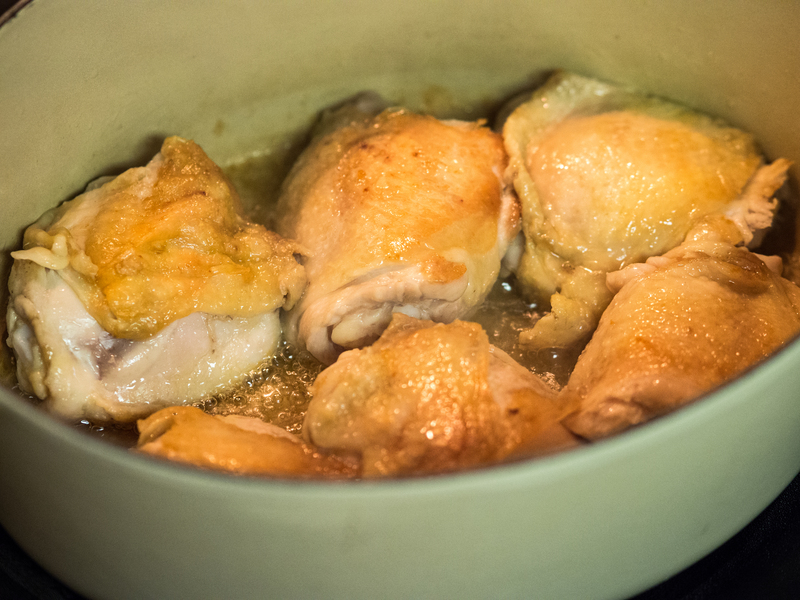 Cook chicken until the skin is a golden brown and flip over. Cook the other side until golden as well. Remove the chicken to a platter and set aside. Saute celery, carrots and onions until the celery is soft. Reduce heat to medium. Add the garlic, stirring to prevent it from burning. When the garlic becomes fragrant, add the red wine, bay leaves and dried thyme and bring to a simmer. Return the chicken to the pan. If the wine does not almost cover the chicken, add the water or chicken stock. Otherwise, you can omit. Cover and place in the oven to finish cooking the chicken through, about 40 minutes. Remove the chicken from the pot, cover and set aside. Combine flour and butter together. 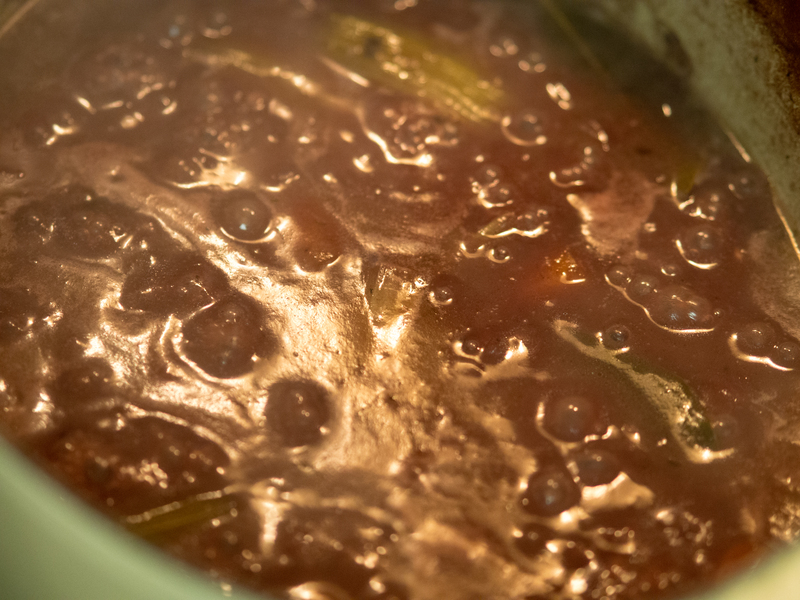 Whisk into the red wine sauce and cook until slightly thickened and glossy. Serve chicken with sauce. 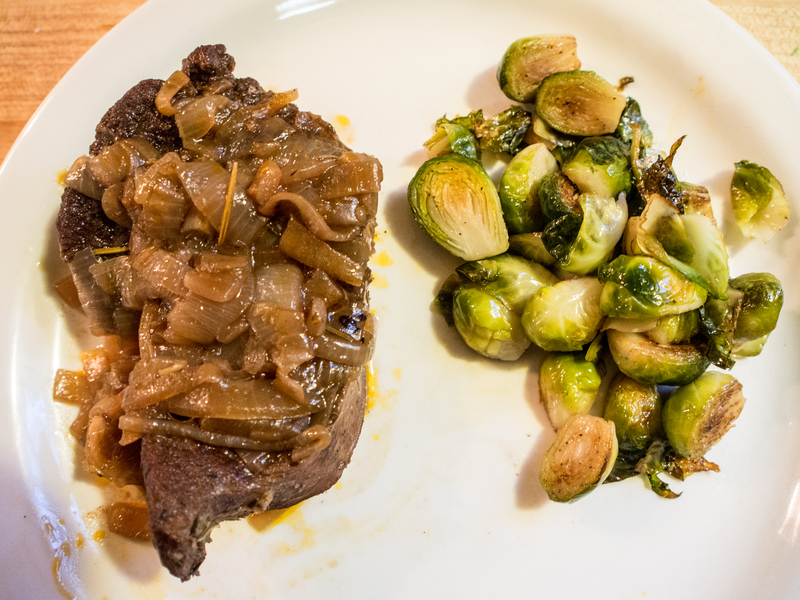 Julia Child’s recommends serving this dish with braised mushrooms and brown braised onions. I made those by sautéing the onions in butter and adding quartered mushrooms and cooking them over medium heat for about 20 minutes. 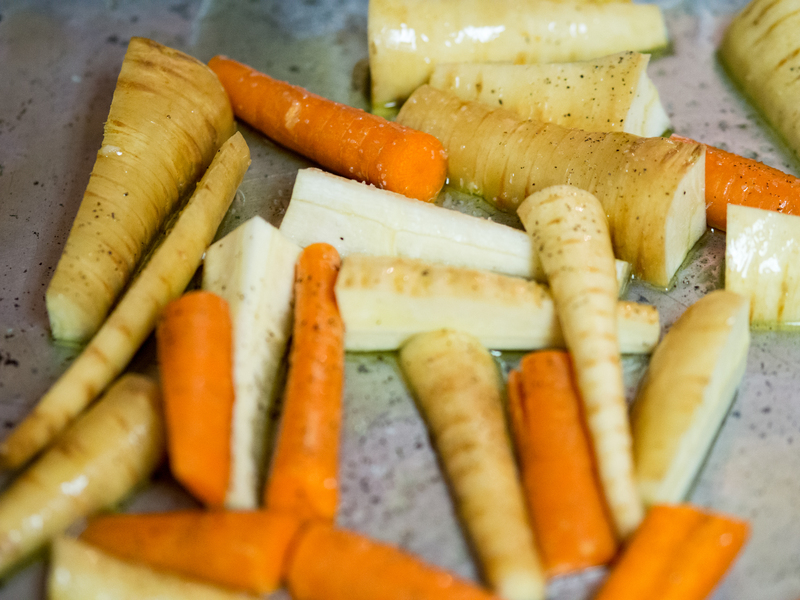 In the pictures, the vegetables in the back are roasted carrots and parsnips. I just heated the oven to 375, roughly chopped the vegetables, covered with oil olive and salt and pepper, and roasted for 20 minutes until browned. I shook the pan occasionally. All told, the dinner took about 90 minutes, but most of that was the chicken cooking in the oven, not active prep time. This entry was posted in Main Dishes, Poultry, Vegetable Side and tagged Chicken, Coq Au Vin, French cuisine, Julia Child, mushrooms, onions, wine on May 9, 2013 by dawn of food. Ah, pot roast. Few thinks provoke a rash of tears like me telling my kids we are having pot roast for dinner. Actual tears. “No, no pot roast!! Sob!” My husband and I are completely stumped. We eat it, it tastes really, really good. They won’t touch it. When I was a child, I remember the tears that pot roast bought to me, but my tears were different (GET OFF MY LAWN!! Sorry, I feel compelled to say that when I sound like a old coot). My mother made “pot roast”. The roast went in a lovely shade of red and came out gray with a nice black bark on top. She served it with gravy. The gravy made is edible and helped the tough swallow factor. That was pot roast. Who wouldn’t cry? One night, when I was in high school, I went to my friend’s house for dinner. When Mrs. Gordon brought out her pot roast, it was moist and glistening with a wonderful pink center. It was beefy tasting and really good. You didn’t need gravy. When I asked her what it was, she laughed and said “pot roast”. No, it wasn’t. Not the kind I knew. I came home and told my mom that one could make pot roast that wasn’t gray. I’m sure she appreciated that. Anyway, she now does a much better pot roast. The key is not only the “pot”, but the lid. I’ve tried pot roast in a slow cooker and, while it’s close to being good, that’s about all I can say. When you make it with a dutch oven, it’s just better. 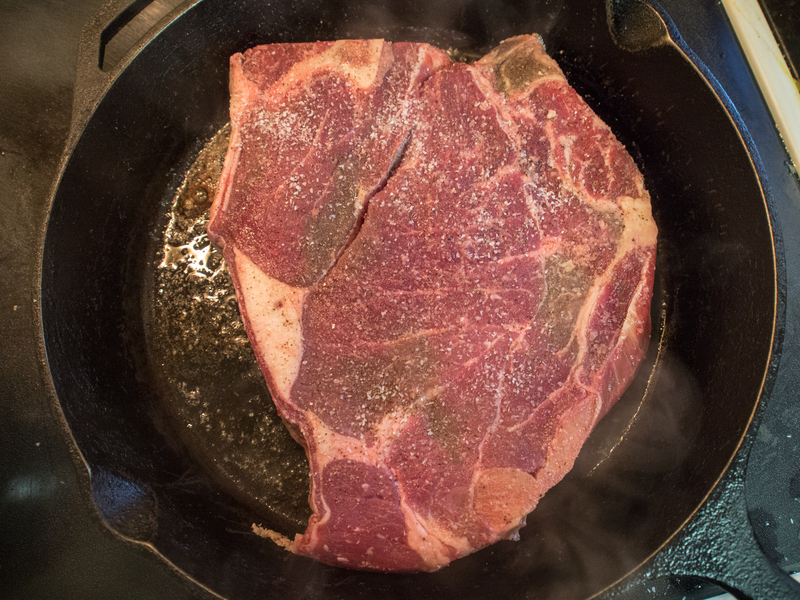 Tough pieces of meat like chuck roast need long, moist cooking time. When they get it, the results are silky, tender, and sublime. Also, and I can’t really emphasize this enough, when you order your cow by the “half side”, you get lots of roasts. Lots of them. Sure you tell them “maximum ground beef”. Doesn’t matter. Roasts are plentiful. Necessity is the mother of invention. I couldn’t have a roast with potatoes, carrots and onions again. Seriously, couldn’t. So tired of it. As I have to kid friendly a bunch of my meals, since they won’t eat the pot roast anyway, I went all out adult on this recipe. Every non-kid friendly ingredient I used it. Wine? Check? Lots and lots of onions? Check. Rosemary? Check. Hitting all the high marks! Pot roast isn’t about measurements. I’ll try my best, but if I say a 4 lb chuck roast and you have a 3 pound one, don’t sweat it. This is definitely a “close enough” recipe. In a dutch oven (I used my trusty 5 quart), heat cooking fat over medium high heat until hot. Salt and pepper the roast and sear on both sides in the dutch oven until each side is browned. Remove and set aside. Lower the heat to medium low. Place the onions in the dutch oven and stir. Salt and pepper the onions (I used around a teaspoon of each). Try to use the liquid of the onions to draw the lovely bits of brown seared roast off the bottom of the pan. 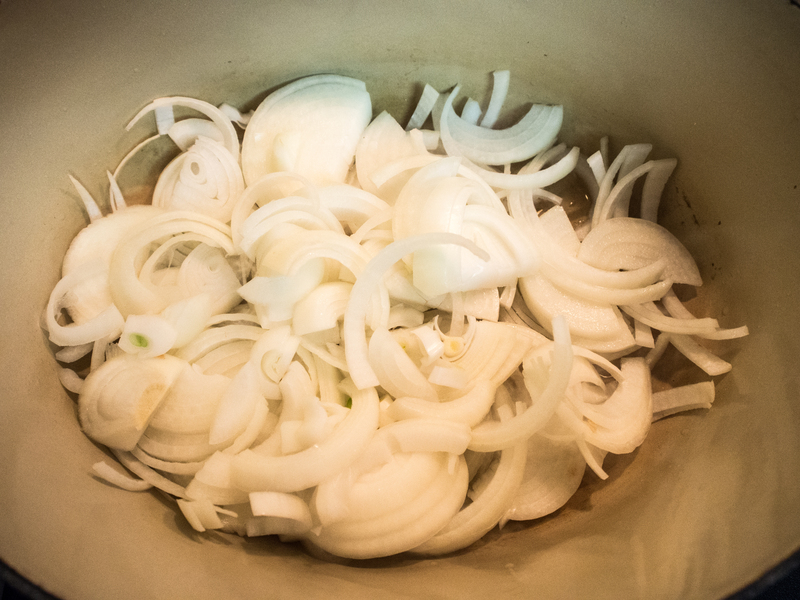 Caramelize the onions, or wilt them until they turn a light brown. This will take a long time and require patience and semi-regular stirring. You may need to add more fat if you find that the onions are sticking. You also may need to turn down the heat if they are burning. Just as the onions are reaching the light brown stage, add the garlic and cook for 2 minutes. Add the thyme, rosemary and bay leaf. Cook for 2 minutes more. Add the tomato paste and cook until you can smell a slightly tomato-y smell (about a minute or so). Add the red wine and stir well, and add the water. Simmer for a bit to get the ingredients married. Return the roast to the pan. Cover and cook in the oven for 1 1/2-2 hours, or until the roast is tender. I served this with sautéed brussels sprouts. 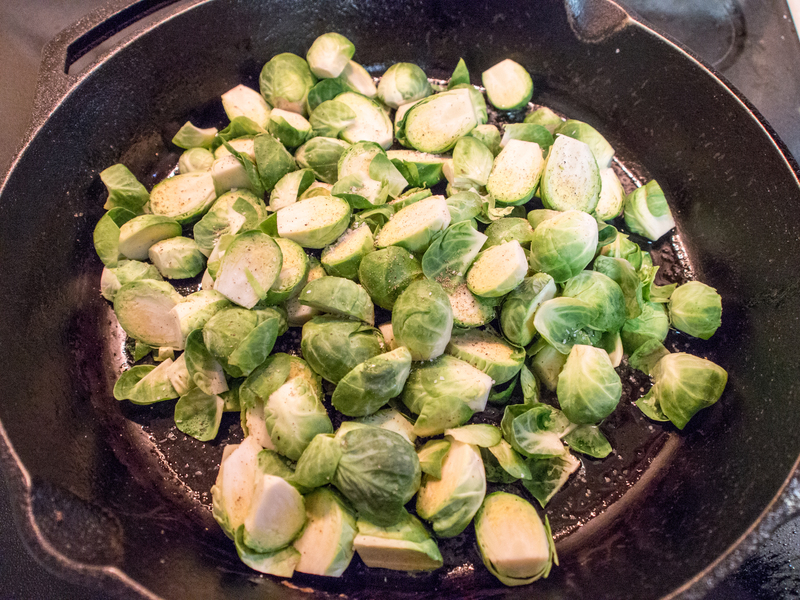 I halved the brussels sprouts and sautéed in bacon grease until caramelized. Finished with salt and pepper. Awesomely good. 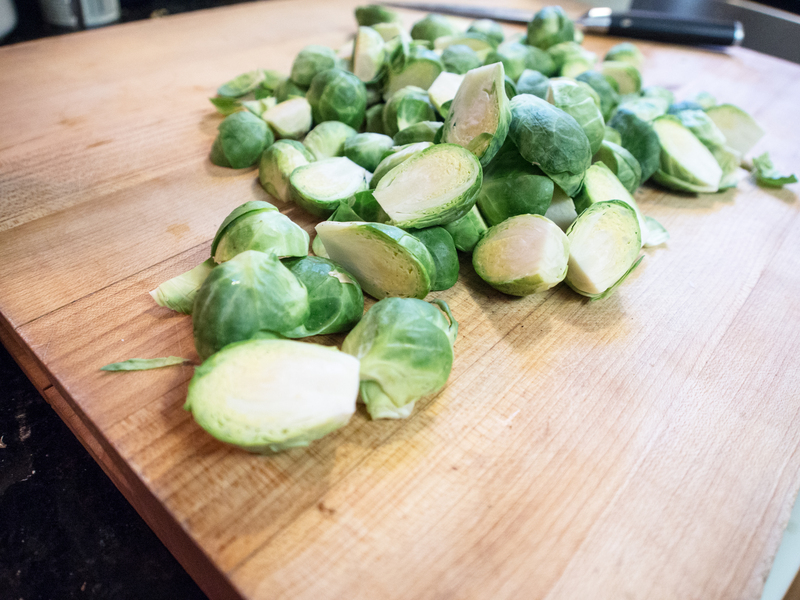 This entry was posted in Beef, Main Dishes, Vegetable Side and tagged Beef, braised, brussels sprouts, Dutch oven, Onion, Pot roast, wine on April 23, 2013 by dawn of food.